Why is so much market research wrong? My love of market research does not blind me to its flaws. Perhaps it makes those flaws more visible to me. Even so, poll numbers are just irresistable, particularly in this election season. 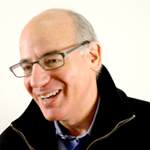 The area where typical market research is typically weakest is the realm of inspiring great new ideas. Traditional market research is deductive. It surveys the world as it exists, quantifies the attributes and allows us to find the “gaps” between what people have and what they want. Almost always the gaps are obvious. The findings of the research is expected. The ideas traditional market research uncovers are by definition derivations of pre-existing ideas. After all, the ideas didn’t already exist, then how could someone think them up and put them into a survey? 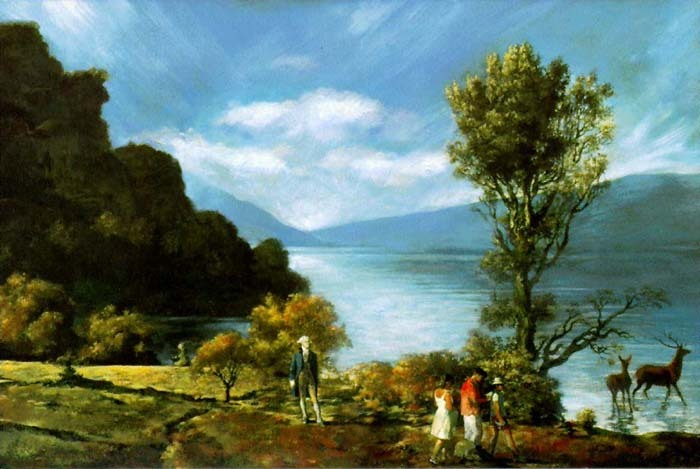 So I will continue with my posting about how 2 artists, Komar and Melamid, used quantitative research in the 1990s to guide their creation of The People’s Choice — the most wanted and the most unwanted paintings of countries around the world. It is a picture perfect example of how the literal use of market research can produce some very un-perfect outcomes. Some background. Vitaly Komar and Alex Melamid are two Russian emigres who moved to the US in the 1970s, with a short stop-over in Israel along the way. They quickly became well-known within the insular art world with a series of increasingly provocative shows and projects. By the 1990s they became “famous” with The People’s Choice project. Interviews in The New Yorker, The Daily News, etc. Famous? Well, they have not yet really crossed over into the mainstream to become household brands the way Warhol or others have. Using other people’s money Komar and Melamid enlisted highly respected researchers to conduct qualitative focus groups and quantitative market research studies in the US and a dozen other countries. Market research in so many countries is a geographic scale far larger than many “global” studies done by multinational corporations. It is comforting to know that design is more important in the decision process for a car than it is for underwear. [Nation Magazine interviewer] N: But there were some surprising results from this poll, yes? AM [Melamid]: Actually, what shocked me was that it was not surprising. I thought there would be much more interesting–I mean, much different results. Because my small experience talking about art with the people of Bayonne gave me quite a different impression of what the people want. They couldn’t exactly say what they want, but seeing artists working gave them ideas of what was possible. The problem is they don’t have examples. Maybe they can’t be asked, maybe language doesn’t work. I was expecting great discoveries, a real vox populi, a high opening. But I think it was the fault of the poll, not the people. It’s the fault of all polls. Maybe people have to be shown. Maybe we have to buy a van and go around the country working on art among people–van art. From Vanguard to Van Art. So they point us in the right direction after all. Using inductive methods of market research are perhaps the most effective ways to really use research for creative new products, new brands, new campaigns. Consider this. Turn the typical branding process on its head. Have your agency develop the creative concepts first. Then take the richest ideas out to consumers. And watch and listen to the way people respond. Does the concept resonate deeply? What are the stories that people co-create with the concept? How do they tell the story of the new ideas? Explore and expand on those ideas. Work with the consumer to turn those stories into mini-movie scripts right there on the spot. Then go to work on deepening, revising and polishing the richest, most robust creative concept. I find great inspiration in the work of two artists, Komar and Melamid. They have much to teach us in the branding world, about the ways we can use market research to better understand what consumers want and how to transform that into compelling brands. Komar and Melamid led the way in the art world. In the mid-1990s they conducted cutting edge quantitative market research to understand what Americans consider the ideal painting. A quantitative study of 1001 Americans was fielded by Martilla and Kiley. It was funded by The Nation magazine’s Institute. Their market research, including qualitative research, along with the resulting artwork were printed by Farrar Straus & Giroux at “Painting By Numbers” in 1997. You can also visit the images of The People’s Choice here. Guided by the research results, Komar and Melamid created the ideal painting for Americans. For instance, 44% of respondents said that blue is their favorite color. Therefore 44% of the canvas is blue. And no great American painting is complete without George Washington, trees, and some deer. It seems to me that we should be developing a proposal for Komar and Melamid to create America’s Most Desired Brand, as well as The World’s Most Desired Brand. Stay tuned! This post contains documentary evidence of the Gap logo recall. 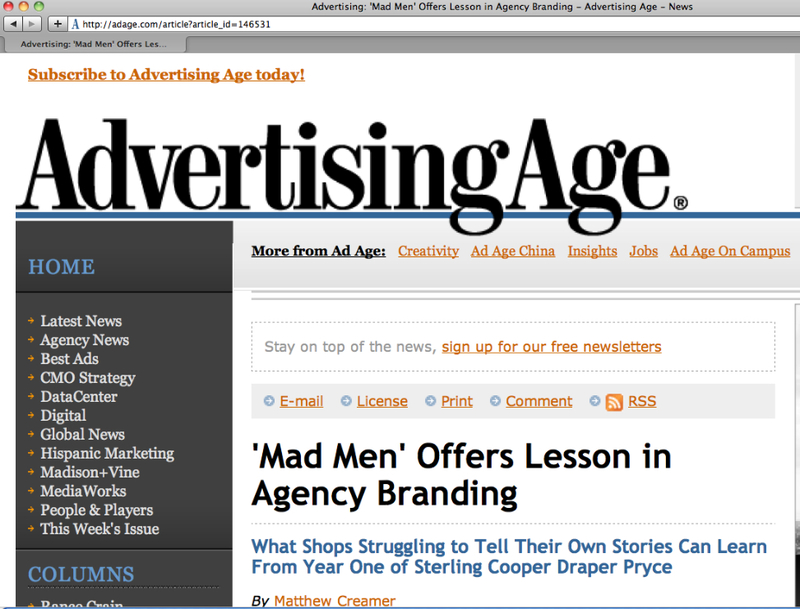 Exhibit #1: Ad Age blames the whole thing on…me! Wow, I was surprised! But there it was, as you can see below. Of course I had nothing to do with it at all. Some people have pointed out that perhaps they meant something else by “the ringer”. Exhibit #3: The real Gap Facebook posting. Back to Square One: Wedged between two denim posts is the acknowledgement that the old Gap is back. So instead of crowd sourcing, we’re bringing back the Blue Box tonight. Another important point to note — contrary to what AdAge reported, Gap did not blame “the ringer” for any of this mess. 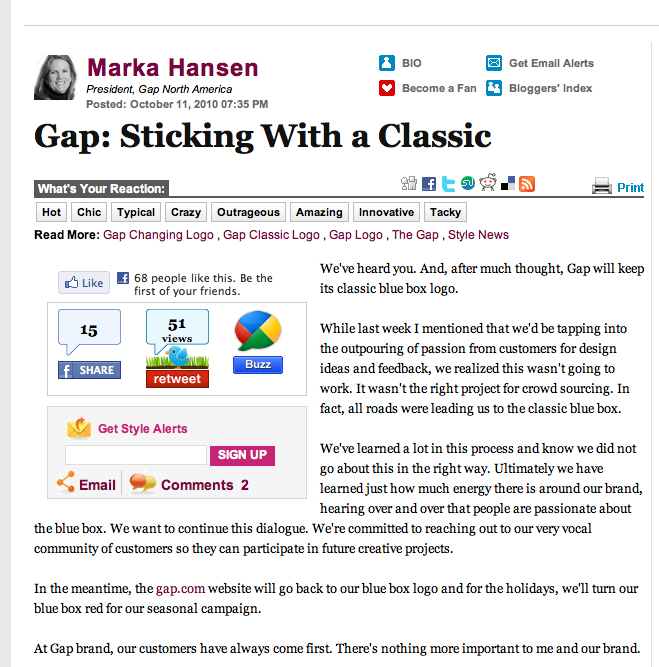 Exhibit #4: Marka Hansen, Gap’s president, posts on the Huffington Post her announcement of the Logo Recall. This is the second time she’s addressed the issue through the Huffington Post. Interesting to note that the Huffington Post is dated 7:35 pm — a full 7 minutes the before Facebook posting. My hypothesis is that because Huffington Post is widely followed by journalists, it is a more effective communications platform to influence the media itself than traditional press releases or through Twitter or FaceBook. It is a good example of how smart marketers can use the media to deliver their message directly instead of through the intermediary of a reporter or blogger. Exhibit #5: The traditional media is slow. 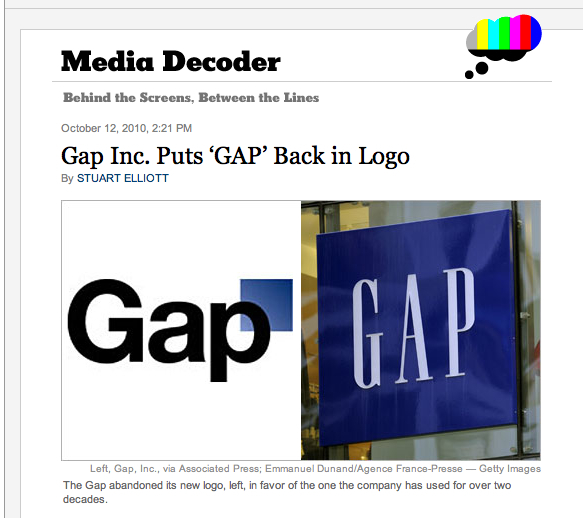 It is not until the next day that the New York Times posts the announcement of the Gap Logo Recall. Even so, it is hard to shake the impression that this is the first time that most readers of the NYT are hearing that the Gap had even changed their logo in the first place. Exhibit #6: Instant Experts: below is a chart from research done for AdAge by Ipsos that raises questions about the market research methodology rather than shedding light on the Logo Recall issues at hand. Ad Age commissioned Ipsos to do an overnight study among consumers on the matter. There are unstated assumptions in the survey questions which need to be examined. For instance, in the first reported questions the language is ambiguous to the point of pointless. It assumes that the company and the product are under the same name and logo. If P&G changed their logo, do you think it would effect the purchase of Tide? The second item is vague — what is meant by “public input”? Does that mean showing it to the whole world? Or does it mean conducting some type of customer research? There is also the assumption that Gap did not conduct any market research of their own. The third item is revealing — 17% of people were aware that “the Gap Store” changed it’s logo. It was a trick question, of course, since the logo was not changed on the store signage or advertising, only on the website. Fourth, was the logo shown in context? People see logos on products, on storefronts, on tv ads. Rarely do they just see a logo sitting on a piece of paper or a computer screen with nothing else around it. Our own experience as well as plenty of academic studies show that context is king. Research on the logo alone, without context, is a poor predictor of actual in-market results. 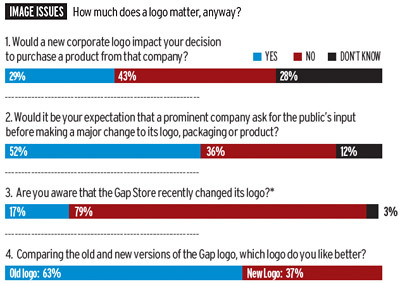 Therefore, if the AdAge/Ipsos study showed the logo in context, then we can have greater confidence in their findings. If, as seems likely, they only showed the logos alone, then the findings are open to question. Exhibit #7: The circle is completed as Armin at Brand New presents another Gap logo, this one for Gap Body Fit, along with their design critique. Indeed it seems that there is a lot more to the whole Gap narrative than simply the Gap Logo Recall episode. Just when you thought you had heard the last of Gap, we bring you… more Gap! This time we get to see the new system, with products and labels and other applications. And it opens up questions about the larger narrative of Gap. How will it all play together? How does the post-recall Gap logo fit with the new lines, the new products, the new strategy? 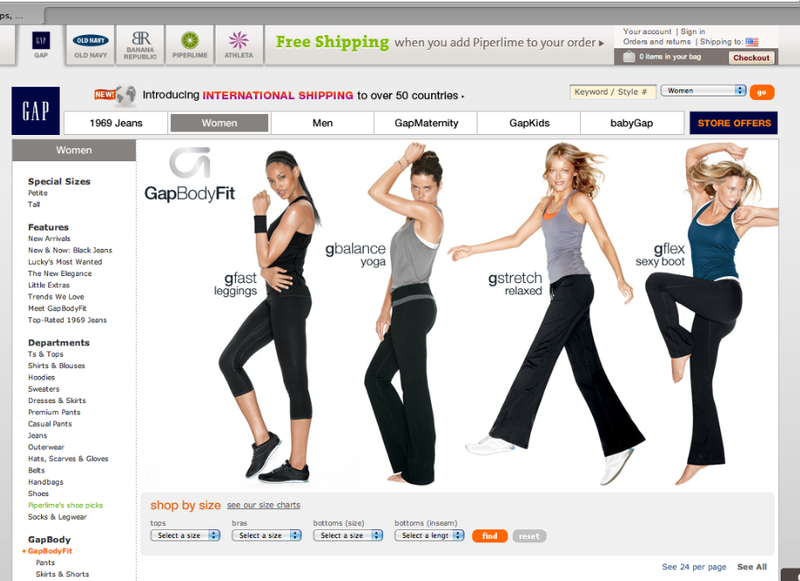 If presented in context with Gap Body Fit, the recalled Gap logo probably would have a completely different reception. We are very proud of our client Cupron who is one of the firms that donated supplies to help protect and improve the health of the Chilean miners while they were trapped underground for 69 days. They are in good company with Oakley, Samsung and Apple, among others, who contributed to the heroic efforts. You can learn more about this amazing story from this TV news report. And you can read about it at the Wall Street Journal. The plain truth is that Cupron’s copper fiber socks are an innovation that improved the lives of the miners. It’s official! 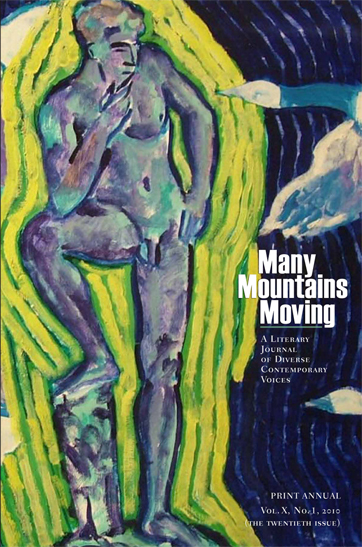 According to the literary magazine Many Mountains Moving, I am a “diverse contemporary voices”. You can see it right there on the cover! The current issue includes my short story Storage. No, you won’t find it under Randall Ringer. Nor Randy Ringer. Long ago Gordon Lish, aka “Captain Fiction”, himself the former fiction editor of Esquire and then a book editor at Alfred A. Knopf, shortened my name to R.C. Ringer. So my parallel career as a fiction writer has been under that name ever since. And you can hear my diverse contemporary voice giving a reading on January 30th at the Cornelia Street Cafe here in NYC. Details to follow as we get closer to the date. There will be other diverse contemporary voices reading including Hal Sirowitz and Thaddeus Rutkowski. with the whiskey is something agencies still wrestle with, 45 years later. Hmmm. A TV show about a fictional advertising agency 45 years ago has a lot of negative things to say about advertising…today? Now let me see if I have this right. Agencies today are going to watch fictional TV shows and learn how to be better agencies. Or is it that they’ll learn about the benefits of AA? You guys over at MadAge are watching way too much TV. You might as well tell us to all follow the great example set by Darrin Stephens from Bewitched. What a week for the Gap branding! The summary: A new logo was introduced on the Gap website on 10/6. A firestorm swept through the design community blogs like Brand New and spread into the general media. By Monday evening, 10/11, the new logo had been withdrawn and Gap executives were acknowledging their mis-reading of customer sentiment. This being several days later, it is time for a sober assessment of the situation, what went wrong and what went right. First, kudos to the executives at Gap for having an early warning system with a very sensitive radar. They caught wind of the online comments within hours. Second, senior Gap executives responded in the appropriate forums and quickly and in the name of senior executives. Marka Hansen was front and center with her response on the Huffington Post. She also responded quickly to journalists blogging online about the situation. Third, Gap did not jump out with a legalistic defense. It was not a series of dense corporate-speak memo. They stayed in the voice of the brand, not in the voice of an attorney. They did not lash out at the critics. Fourth, Gap was willing to take actions in the face of the outcry. We can debate if it was the right action but they did respond and take concrete steps to address the situation in near record time. Not to say that Gap’s handling of the situation was flawless. 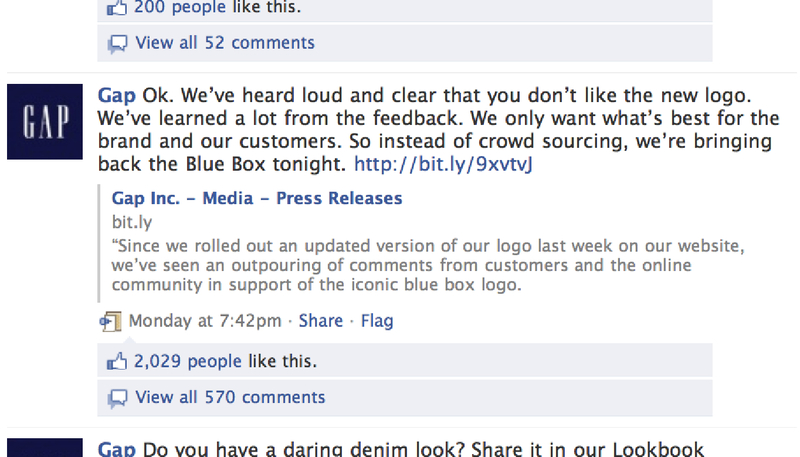 The initial Facebook response fanned the flames among the design community. By calling for everyone to submit their own ideas for the Gap logo – aka crowd sourcing – it hit an exposed nerve in the design world. Crowd sourcing has been blamed for many of the troubles in the design industry. It would mean a whole new approach to market research to anticipate the Gap uproar — because the Gap uproar happened among a community that is not representative of core Gap consumers. After all, who would expect Gap to test their logo among the design community? And the design community is notorious for having strong opinions that don’t really influence anyone. Blogs have amplified the opinions of designers but haven’t really made them any more influential in almost all situations — except for this. So, does this now mean open season on all new rebranding programs? Or was it an outlier, a black swan? I believe this is part of the new normal. Every CMO from this point forward will be thinking of Gap and Tropicana as they consider their rebranding plans. The risks of rebranding have just gotten higher. The old way of marketing is leading to new troubles. Branding needs to more flexible than ever before. I believe that the Gap situation is one more reason why marketing needs to be reinvented for the reality of today’s digital world. The traditional methods of branding, the traditional tools of market research — they have lost their effectiveness and need to be replaced.